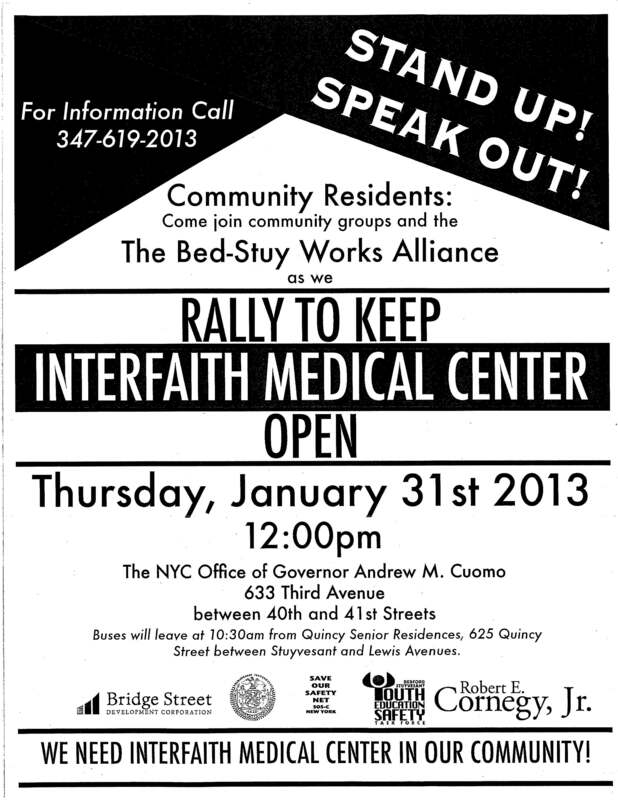 Join us for an important Town Hall on Interfaith Hospital. Community, labor, and advocates will unite to discuss the pending changes to health care in Central Brooklyn. Yesterday, June 28th – SOS-C members joined workers, advocates, and community members to say SUNY Downstate needs to stay open! No layoffs! No reduction in services! Central Brooklyn, a medically under-served community, needs more health care resources not less. Here are some photos from the rally. On June 18th, 2012 a public hearing was held at Bronx Community College to gather public comment on the proposed 1115 waiver. The “super-waiver” comes on the heels of massive cuts to the Medicaid budget in 2011 as part of Governor Cuomo’s Medicaid Redesign Team (MRT) process. The MRT – a 27-member team with very little consumer or public health representation – cut $2.2 billion dollars from the Medicaid budget – many of these cuts falling on the backs of low income communities of color and immigrant communities already struggling to access health care in their neighborhoods. The super-waiver rewards these cost saving measures – and SOS-C believes that it is only fair that this money goes towards bolstering the health care safety net and adopting reforms that will help to eliminate health disparities. Improving the process so that it is accessible to all – including folks with disabilities, limited English proficient populations, working families, etc. Not using Brooklyn redesign process as a model for similar communities across the state. Once again, New York has the opportunity to channel funds towards reforms and initiatives that will bolster the health care safety net. This will prove cost-saving and life-saving for many years to come. We urge all to get involved now as the waiver plan is being formulated. More information on community engagement can be found at this link. Click here to read SOS-C talking points for the super-waiver public hearing. Now that the Medicaid Redesign Team’s Brooklyn Workgroup has made its recommendations and fled the borough – we are busy working with other health care advocates and community stakeholders to pick up the pieces and make sure the health care saftey net in Brooklyn is protected. Of particular concern is Wyckoff Heights Medical Center – the North Brooklyn safety net hospital – which in recent months has seen their dirty laundry aired in the press and is at risk of losing HEAL NY funding which would deal a serious blow to the hospital’s bottom line. At the end of 2011, the Brooklyn Health System’s Redesign Work Group released it’s recommendations for reforms of the Brooklyn health system, in particularly its financially vulnerable hospitals. In this report, Berger and his team recommended a number of proposals that would negatively impact access to quality, affordable health care for many residents of North and Central Brooklyn – especially communities of color. As a response, the Save Our Safety-Net Campaign has developed a response that summarizes and critiques the Brooklyn redesign process, gives an overview of the health needs of affected communities, and outlines policy recommendations that will help, not hurt, the health care safety net in Brooklyn so that all New Yorkers can have access to affordable, quality health care in their communities. Click here to read the policy memo. 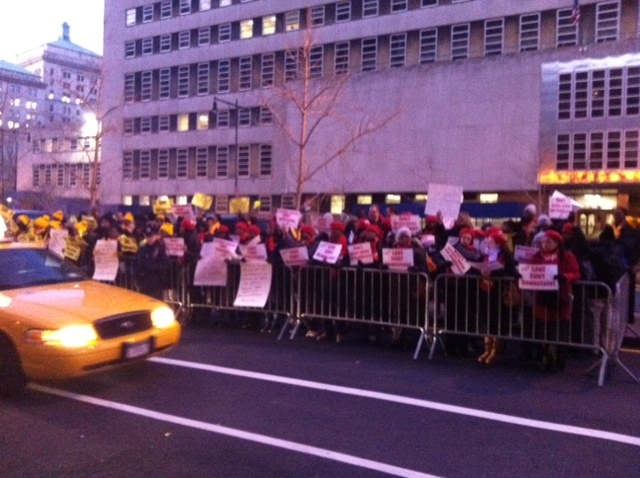 Protesters outside Brooklyn Bridge Marriott. Early Wednesday, January 11th, busloads of protesters descended on the Brooklyn Bridge Marriott to voice their disapproval of policy recommendations laid out in the Health System Redesign: Brooklyn Workgroup’s Report. The report calls for the merging of 5 hospitals – Wyckoff and Interfaith with Brooklyn and Brookdale with Kingsbrook Jewish. The report also recommends the closure of Kingsboro Psychiatric Center and the moving of SUNY Downstate facilities in Central Brooklyn to their LICH campus in Cobble Hill. The plan would remove approximately 1200 beds from the North and Central Brooklyn communities and potentially cut 100s, if not 1000s, of jobs. 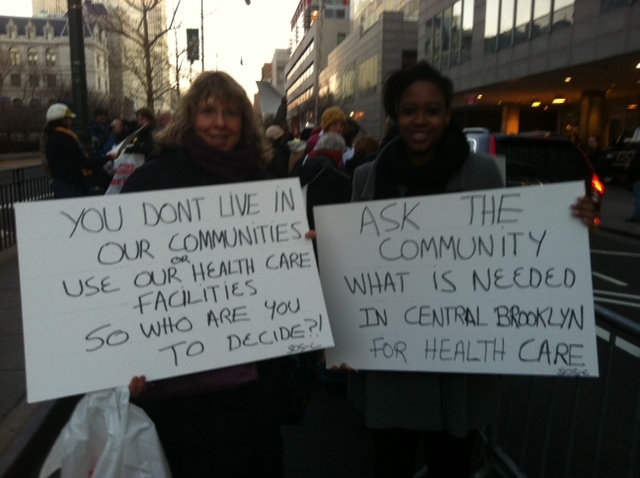 Unions, community organizations, advocacy groups and Occupy Wall Street-ers all came out to protest the recommendations and support the preservation of vital health care resources and jobs – both of which are severely lacking in North and Central Brooklyn. 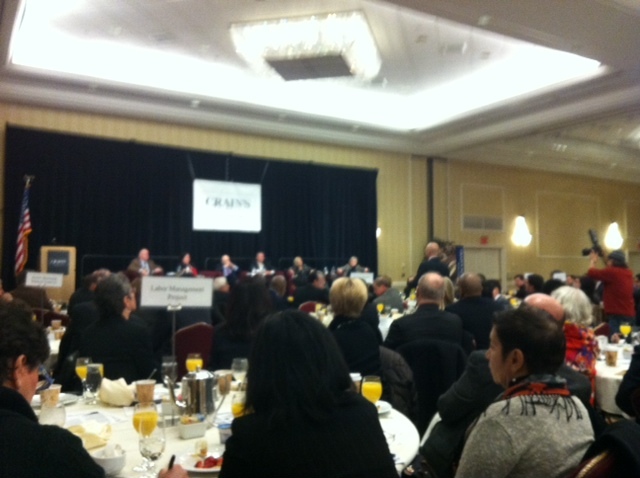 Inside the hotel, Crain’s New York – the city’s premier business publication – hosted a $75-a-plate breakfast feauring a panel discussion on the topic of “Solving Brooklyn’s Hospital Crisis”. Featured on the panel was Stephen Berger, financier and head of the working group; Ken Raske, President of the Greater New York Hospital Association; Pam Brier, President and CEO of Maimonides; and Linda Brady from President and CEO of Kingsbrook Jewish. The panel, all white, was a stark contrast to the protesters outside – mostly people of color who actually live, work and get care in the communities affected by the report’s recommendations. 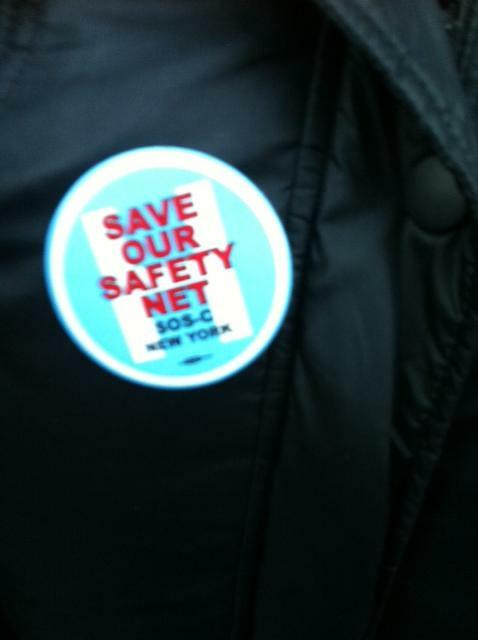 Members of the Save Our Safety Net Campaign (SOS-C), were both inside and outside of the event. After about an hour long discussion of the implications of the report – mostly focusing on the financial aspects of the plan with little discussion of the impact on consumers and surrounding communities – four members of the audience were allowed to ask questions. Wearing our SOS-C buttons inside the breakfast. Time was on the side of the panelists, because after Ngozi’s poignant question the moderator ended the event – leaving the community, somewhat fittingly, still unanswered.